There are many devices on the market to help open up a wine, aka decant, so that it is ready for drinking. People usually decant a tannic red wine to soften the tannins and to get the aromatics in the wine to become more open. Younger wines tend to need more decanting time than older wines as the older wines have slowly been exposed to air through their corks. The simplest decanter is a glass vase of varying shape, usually with a wide middle and tall and narrow neck. The wider centre portion allows more surface area of the wine to be exposed to air, plus gives the person decanting the wine a chance to swirl the wine in the decanter a bit to help the aeration process. With younger more tannic wines you could decant for half a day or longer before the wine is sufficiently softened and opened. But many people cannot wait that long. Once the bottle is open, they would like to drink the wine. A new decanter on the market, the vSpin Active Decanting System, automates the decanting process in 3-5 minutes. 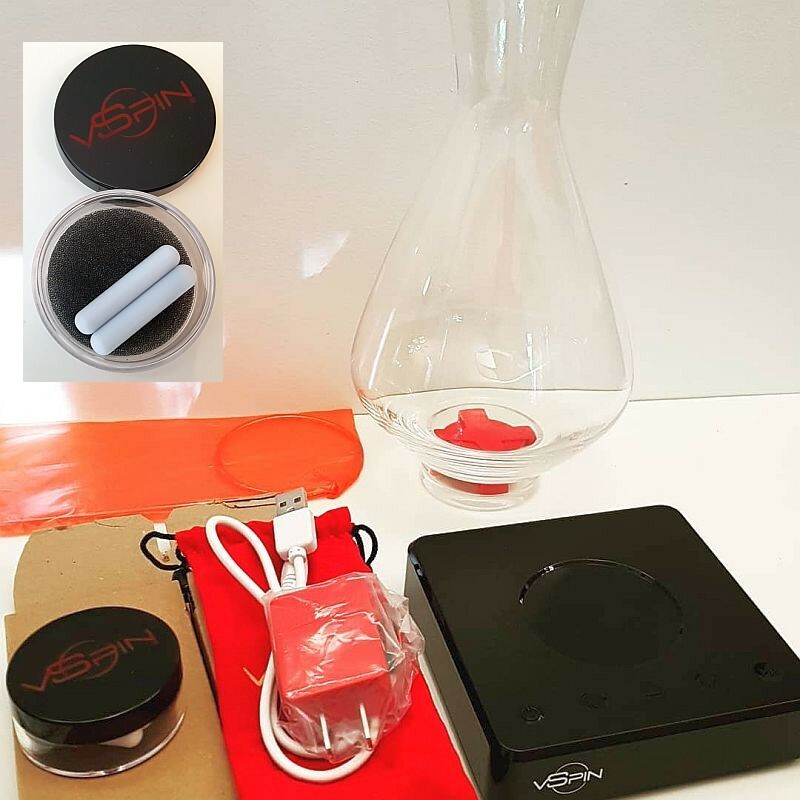 They claim that 4 minutes of vSpin decanting is equivalent to 4 hours of decanting. That is quite a feat. How Does the vSpin Work? vSpin creates a gentle, silent vortex which greatly increases the surface area of the wine exposed to air, accelerating the aeration process. The picture below shows the different components. The base has a rechargeable battery and needs to be charged before first use. There is a timer across the front of the base that automatically sets the decant time to 5 minutes. Across the top of the base in the front is the on/off button, add/subtract time, speed, and pause. You may not want to decant an aged wine for 5 minutes; you may only want 2 minutes, so the pause is a useful feature. The crystal decanter is made by Spiegelau. In the base of the decanter is a “x” which I think is made with metal, and coated in plastic. It is inside the glass decanter, and does not touch your wine. The last part of the vSpin is a short, ~1″, metal stirring rod covered in a food-safe white plastic. You place this stirring rod inside the vSpin decanter. You can tell it is magnetic as it aligns immediately with one of the arms of the ‘x’ in the decanter. To decant, take the decanter off the base, then turn the base on. It will show 5:00 on the front of the base. Open your bottle of wine and pour the entire bottle in the decanter, then place the decanter on the base. 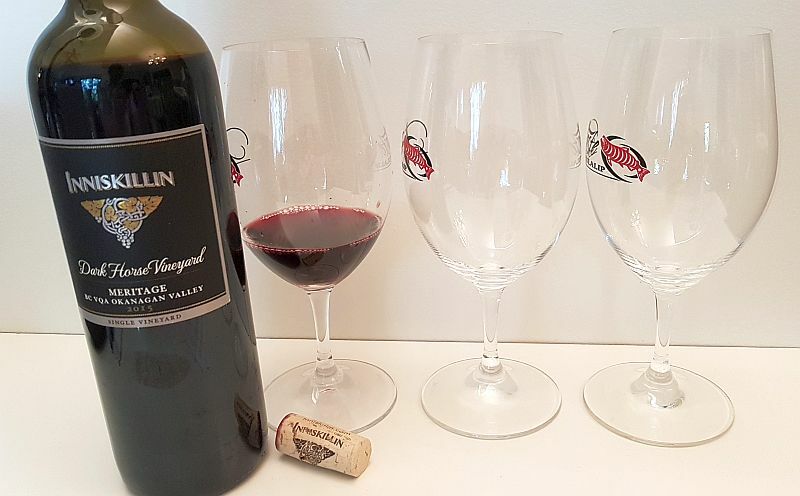 As I was testing the vSpin I first poured a small amount in a wine glass so that I would have a before-after comparison. Immediately the small white rod will start to spin and create a small whirlpool, or vortex, in the center of the decanter. The vSpin is very quiet. I watched the timer till it counted down to 2 minutes (making a 3 minute decant), then pressed the pause button. I poured out some of the wine into an empty glass. I put the decanter back on the base and pressed the pause button again to resume decanting and let it count down to zero, giving me a 5 minute decant. I poured some wine into a third glass. I have been told that if you lift up the decanter the timer will stop and then resume when you replace the decanter, so you do not necessarily need to use the pause button. The wine I was decanting, as you can see above was the Inniskillin Dark Horse Vineyard Meritage 2015 from the south Okanagan. I checked the back label to see how the wine was described before I purchased it. The back label noted that the wine has ‘firm tannins’. How did the wine taste before decanting, after 3 minutes, and after 5 minutes of decanting with vSpin? The colour of the wine did not change. The wine in all three glasses was a deep ruby colour. No decanting: Medium plus intensity, youthful aromas of ripe juicy red fruit, red cherries, oak and vanilla, along with a hint of smoke and capsicum. 3 minute decanting: Medium intensity, developing aromas of toasty red fruit and oak. 5 minute decanting: Medium intensity, youthful; a mix of vanilla and red fruits primarily, but also some plum and smoke. No decanting: Medium plus body and flavour intensity. Medium acidity and medium plus tannins. Round, with an almost thick mouthfeel. You can feel the tannins gripping in your mouth. Flavours of raspberries, red cherries, plum, vanilla, sweet spice and oak. Medium plus length. Peppery finish with grippy tannins. 3 minute decanting: Full body with pronounced flavour intensity. Medium acidity. The tannins seem rounder and more integrated with the wine. A very round mouth feel. Flavours of ripe cassis, red fruits, raspberries, plum, vanilla and oak. Medium plus length. Softer tannins on the finish, that linger longer. Not very peppery on the finish. 5 minute decanting: Medium plus body and flavour intensity. Medium acidity. Silky, soft tannins up front, that get more grippy at the finish. Sweet red fruit, plums, raspberries, vanilla, and some black fruit on the palate. A note of minerality as well. Medium plus length, a bit grippy on the finish, and no pepperiness. Overall I would say that the 3 minute decanting produced the nicest tasting glass of wine for me. It seemed that the wine became grippy again with the full 5 minute decant. So you may need to be careful with the amount of time that you decant. I would suggest erring on the side of caution and try 3 minutes of decanting for a young red wine. The vSpin did work. The wine did open up and the tannins did soften and were rounder with the 3 minute decant. If you can’t wait 3 hours to decant your wine, then the vSpin would be a good alternative with only 3 minutes needed. Where Can I Buy the vSpin? 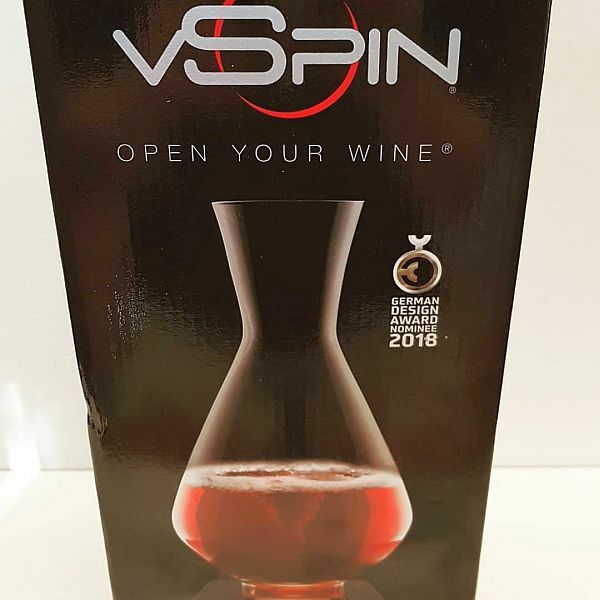 The vSpin is available through Amazon.ca and Amazon.com online, but if you prefer a brick and mortar store you can purchase it as well from Everything Wine in BC. It retails for CAD$299.99 at Amazon.ca and US$250 at Amazon.com. Enjoy.